Unfortunately, it’s also a time when a lot of damage can come to their teeth. But the snacks you serve at home don’t have to be packed with mountains of sugar and salt. You can still serve up some devilishly tasty, but healthy, treats – just don’t tell the kids that the snacks are actually good for them. You can get your chocolate fix with this delicious, low-calorie treat. 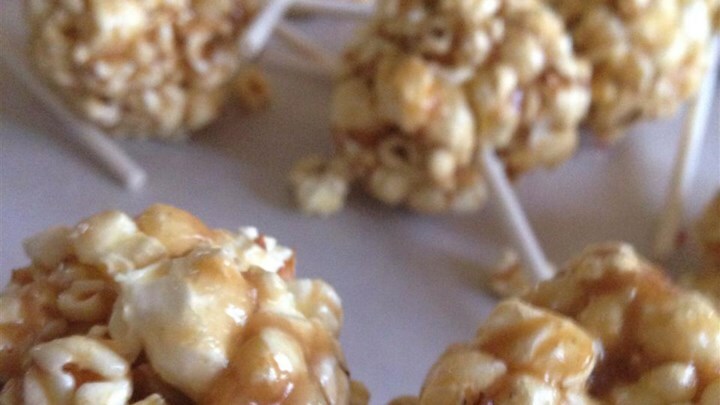 Start by mixing the popped popcorn with semi-sweet chocolate chips, then set aside. Next, heat up 3 to 4 tablespoons of honey and 3 to 4 tablespoons of peanut butter in a saucepan. Once it starts to boil, pour the mixture over the popcorn, making sure everything is combined, then roll into small balls. Let it cool off on some parchment paper before serving. 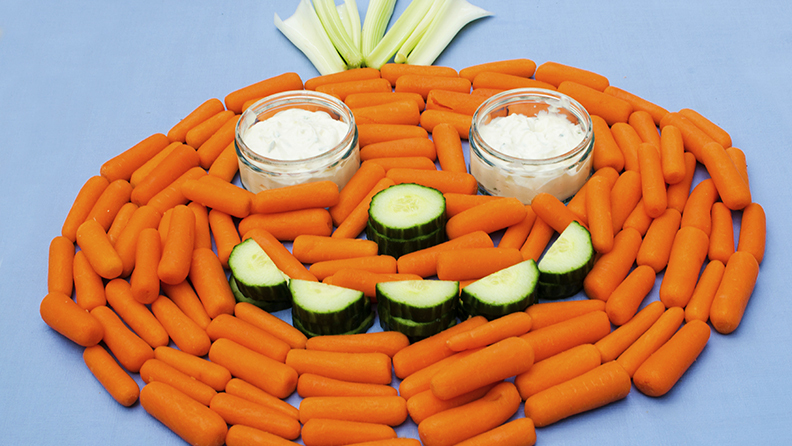 Fill a tray with baby carrots so that it forms the shape of a pumpkin, using black olives as the eyes and mouth. 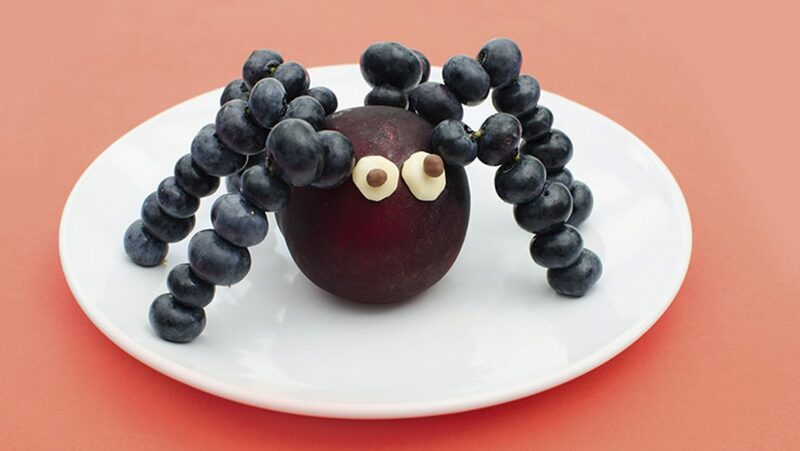 Create a spider out of blueberries or grapes, with a plum for the body. You can use pretzel sticks to hold the blueberry/grape legs together and to attach them to the plum. 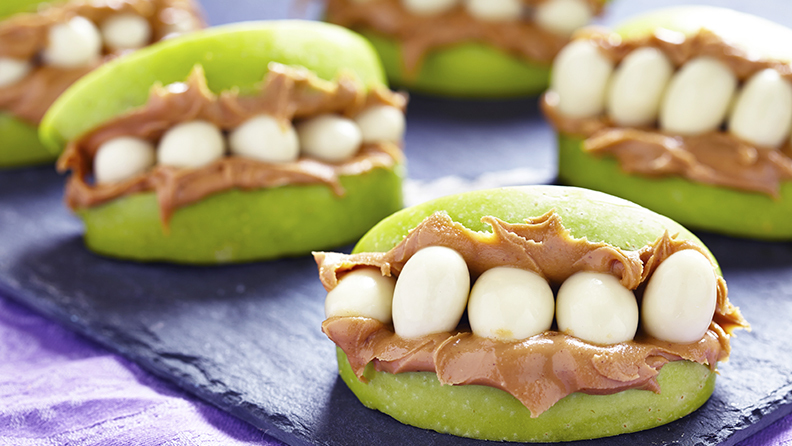 Use two apple slices, skin-side out, to create a scary looking mouth, holding it in place with peanut butter & little yogurt balls for teeth. Apple cider is relatively easy to make, especially if you buy a large (64 ounce) bottle of apple cider from the store. 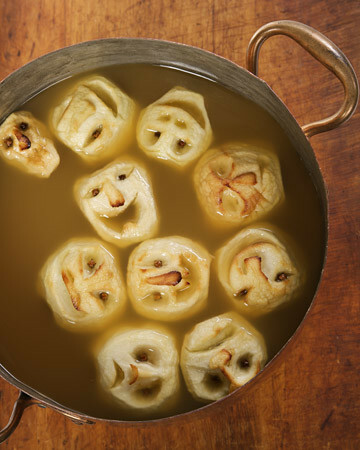 First, though, you’ll have to start with the spooky faces for the cider. Preheat your oven to 250 degrees, then start peeling some apples. Afterward, cut the apples in half, removing the seeds and stems. Now is a good time to carve a scary face into the apples using a paring knife. From there, soak the apples for one minute in a small bowl with two cups of lemon juice and a few tablespoons of salt. Drain the apple slices on a paper towel before placing them face-side up on a baking sheet, cooking them for about an hour and a half (the apples should be dry and brown along the edges). After your apple slices are ready, then it’s time to start the spiced apple cider. Aside from the large bottle of apple cider, you’ll also need three to four cinnamon sticks, one teaspoon of whole allspice, one teaspoon of whole cloves and 1/3 cup of brown sugar. Combine the apple cider and the cinnamon sticks in a slow cooker, and while that’s going, wrap the allspice and cloves in cheesecloth, then add that to the cooker. Next, stir in the brown sugar. Once it starts to boil, reduce the heat. All that’s left now is to add the scary-looking apple slices to the cider, once they’re ready. 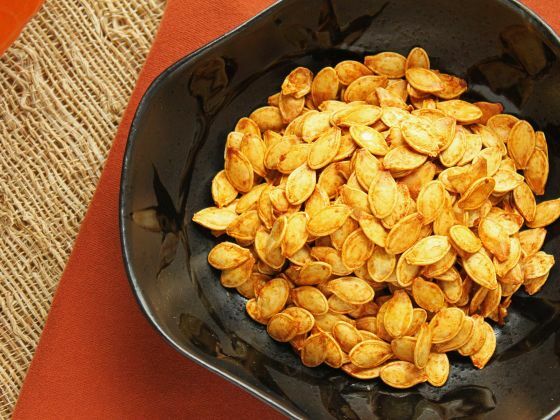 Once you finish carving up your pumpkin, save the seeds. Preheat the oven to 300 degrees, then pour all the seeds into a small bowl and set aside. Next, melt a couple of teaspoons of butter, then add a touch of sea salt and garlic powder. Once that’s ready, pour the mixture over the seeds, mixing them and then spreading them out over a single layer on a baking sheet. Cook the seeds for about 45 minutes, stirring them occasionally as needed. The day after Halloween doesn’t have to be one filled with stomach aches and grumpy kids who are coming down from their sugar highs. 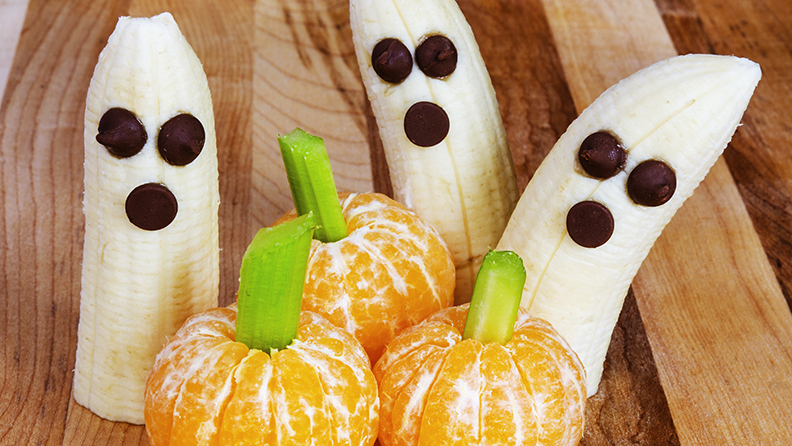 These snacks are not only tasty, but they’re also festive enough that your kids might not notice that they’re eating something healthy.